Moticare tablet: Each film coated tablet contains Domperidone Maleate BP 12.858 mg equivalent to Domperidone 10 mg.
Domperidone is a dopamine antagonist that principally blocks the dopamine receptors located in Chemoreceptor Trigger Zone (CTZ) and stomach. Its gastroprokinetic action is based on its blocking effect of dopamine receptors that have an influence on the motility of gastro-intestinal tract. Due to its weak penetration across the blood-brain barrier, Domperidone has almost no effect on the dopaminergic receptors in the brain therefore excluding psychotropic and neurologic side effects. Domperidone restores normal motility and tone of the upper gastro-intestinal tract, facilitates gastric emptying, enhances antral and duodenal peristalsis and regulates contraction of the pylorus. Domperidone also has increases esophageal peristalsis and lower esophageal sphincter pressure and thus prevents regurgitation of gastric content. Epigastric sense of fullness, early satiety, feeling of abdominal distension, upper abdominal pain, bloating, eructation, flatulence, nausea and vomiting, heartburn with or without regurgitation of gastric contents in the mouth. 2. Nausea and vomiting of functional, organic, infectious or dietetic origin or induced by radiotherapy or drug therapy. 3. Parkinson's disease: Dopamine agonists induced nausea and vomiting. Adult: 10 mg (1 Moticare tablet) 3-4 times daily before meals and, if necessary, before retiring. Adult: 20 mg (2 Moticare table) 3-4 times daily before meals and, if necessary, before retiring. Remarks: Domperidone is recommended to be taken before meals. If taken after meals, absorption of the drug is somewhat delayed. In patients with renal insufficiency, the dosing frequency should be reduced. Pregnant women: The safety of Domperidone has not been proven and it is therefore not recommended during pregnancy.Animal studies have not demonstrated teratogenic effect in the fetus. Lacting mother: Domperidone may precipitate galactorrhea and improve post-natal lactation. It is secreted in breast milk but in very small quntities insufficient to be considered harmful. Side effects: Domperidone may produce hyperprolactinemia (1.3%).This may result in galactorrhea, breast enlargement and soreness and reduced libido. 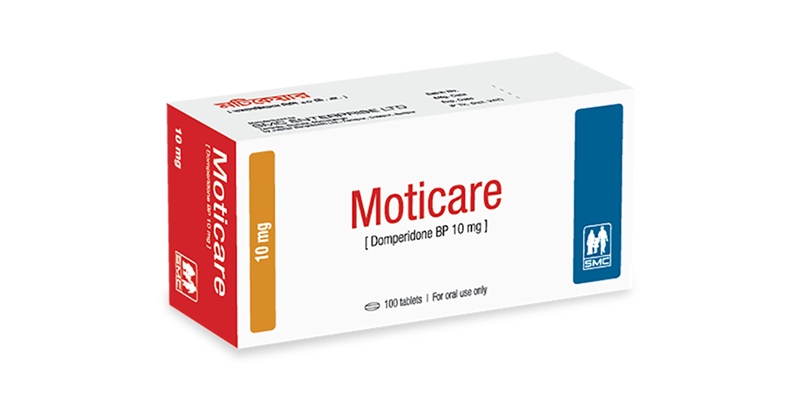 Dry mouth (1%), headache (1.2 %), nervousness, drowsiness (0.4%), diarrhea (0.2 %),skin rash and itching (0.1%) may occur during treatment with Domperidone. Extra- pyramidal reactions are seen in 0.05% of patients in clinical studies. Contraindications: Domperidone is contraindicated in patients with known intolerance to the drug. Domperidone should not be used whenever stimulation of gastric motility might be dangerous, e.g. in the presence of gastro-intestinal haemorrhage, mechanical obstruction or perforation. Domperidone is also contraindicated in-patients with a prolactin-releasing pituitary tumour (prolactinoma). Special warnings and precautions: When antacids or antisecretory agents are used concomitantly, they should be taken after meals and not before meals, i.e. they should not be taken simultaneously with Domperidone. Use in liver disorders: Since domperidone is highly metabolised in the liver, domperidone should be used with caution in patients with hepatic impairment. Use in kidney disorders: In patients with severe renal insufficiency (serum creatinine > 6 mg/ 100 ml, i.e. > 0.6 mmol/l) the elimination half-life of domperidone was increased from 7.4 to 20.8 hours. Drug interactions and other forms of interaction: Concomitant administration of anticholinergic drugs may antagonise the antidyspeptic effect of domperidone. Antacids and antisecretory drugs should not be given simultaneously with Domperidone as they lower its oral bioavailability. Moticare tablet: Box containing 100 tablets in blister pack.